Santiago Achurra Larrain founded his vineyard, Vina Requingua, in 1961, some 3,000 feet above sea level in Chile's Central Valley. Today, the second generation of the family is working together to continue creating outstanding wines. The grapes for our selection were sourced just west of the Andes Mountains, in Chile's Central Valley. As in Argentina's Mendoza region, the high elevation and latitude here provide sunlight on the vineyards long after other vineyards are dark. This allows very slow maturation of the grapes, without the typically associated heat. Too many California winemakers believe that heat is good for grapes. The fact is, it's the light from the sun, not the ambient temperature, that grapes love most. Light influences photosynthesis, which helps mature the natural sugar in the grapes while retaining their natural acids. Acid is an important component in wine. It carries the flavors from the front of the mouth to the back and accounts for the wine's finish. Without acid, the wine would be dull and flabby. 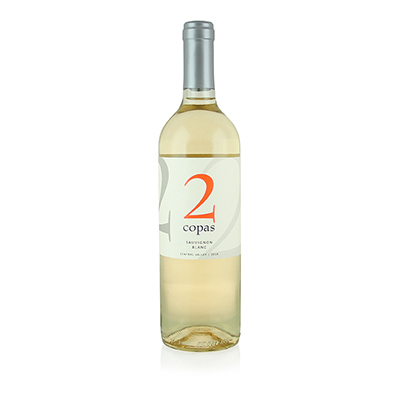 The name 2 Copas means "two glasses" in Spanish, signifying that you can't have just one glass. That would certainly be the case here. While Chile is known for the Bordeaux varietals of Cabernet Sauvignon and Merlot, it's the Sauvignon Blancs from here that have knocked us out. This one is no exception. The purity of flavors is so engaging. Lively stone fruit, fresh herbs and spice sing out in the aroma and flavor, and citrus provides the fantastic finish.